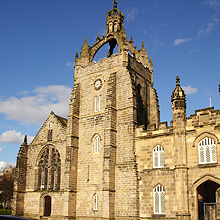 Scotland’s public buildings include a myriad of building types, ranging from the medieval tollbooth to the Georgian university and Victorian public library. These buildings are often key landmarks, their dominant location and striking architecture punctuating the skyline. They also comprise a high proportion of our built heritage, noted for their fine ashlar facades, grand ornamental plasterwork and ornate carved stonework. However, these important buildings can often prove a financial burden in terms of on-going repair and maintenance. Our built fabric is at risk from increasing costs of repair, changing economic demands and ultimately a lack of public recognition. LTM are committed to the conservation or our built heritage and can assist local authorities and other owners/occupiers of public buildings. LTM’s respected masonry teams, supported by our in-house Stone Conservators and Traditional Plasterers can tackle a wide scope of conservation work, ranging from small scale maintenance repointing work and stone repairs to grant-funded reinstatement of architectural masonry details and ornamental plasterwork schemes. LTM Consultancy can also provide professional, technical advice on building defects and problems, as well as undertaking maintenance inspections and detailed stone and plasterwork condition surveys. We can provide bespoke surveys designed to meet the needs of the building and the client - this can form an essential step in preventative maintenance and addressing concerns over falling masonry and associated health and safety concerns.